In its voyage to the stars, Genesis Alpha One gets waylaid in some empty place in between. Genesis Alpha One splices the DNA of some good ideas, but doesn’t execute any of them well enough. You rarely see this addressed in the great space operas, but the process of space travel can be boring. Sure, you might feel giddy when you see the Earth’s curvature below you for the first time, and you can look forward to an obligatory existential crisis as the planet and then the sun become indistinguishable from all the other pinheads of pure white light in your perceived sphere of space, but what comes after that? Maybe you start tiring of your functional metallic surroundings, designed to joylessly keep you alive. The dense bricks of space food will dull your taste buds within a week, and you may find that your crewmates—the people you’re presumably going to share the rest of your life with—are a dissonant bunch that you have nothing in common with, making for an infinity of stilted conversations in the canteen. Oh, and you’ve just received word that there’s another fungal bug infestation in the service tunnels. Well, better get to it then, seeing as you’re not only the ship’s captain, but also the only capable pest controller onboard. 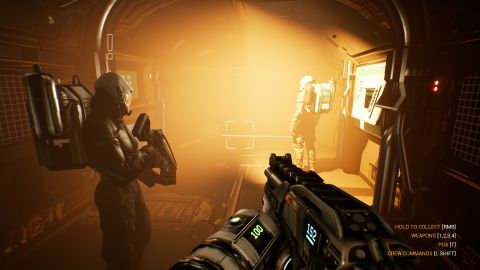 That’s the scenario of roguelike, first-person shooter and base-building game Genesis Alpha One—space opera without characters; space exploration without context. The constituent parts for something interesting are here though. You start out with a crew of human clones embarking on the Genesis project—a corporate-funded mission to find humanity a new home. Your perspective in the game is divided between controlling your crew captain in first-person, and building and expanding your spaceship on a 3D grid. The cosmos is depicted through a procedurally-generated tile-based map, which you traverse using a simple turn-based screen from the bridge of your ship. When you reach galaxies, you touch down on planetary surfaces in search of resources and upgrades, use those to expand and upgrade your ship, assign tasks to your fellow clones, then beam the ship to different galaxies once you’ve bled that system dry (and yes, what little story there is does allude to the classic ‘space travel is the new colonialism’ platitude). It’s a logical and varied loop of activities, bolstered by the fact that the ship-building system is modular and accessible in a way that doesn’t take you hours to get things done. You plonk down ready-made modules such as weapon workshops, research labs for making new clones, and greenhouses where you can grow plants that provide a biosphere for the various human-alien hybrids that’ll eventually populate your ship. You connect all this up using corridors, lifts, and eventually teleports, and can set up defensive measures like decontamination chambers, gun turrets and security gates in case any alien life gets onboard. Next, you set your crew to automatically work in the various modules, but you need to be there in person a lot of the time to decide what they should be working on: which debris to mine using the Tractor Beam, which clones to create, and which weapons to build. You have to do a lot of running around to make sure everything is working efficiently, so it's best to make sure your ship is sensibly laid out. Then you can step back to watch robots carry resources from your harvester to the storage as your crew diligently perform their assigned tasks. There’s a satisfaction to seeing everything running in a factory-line sort of way. Your ship layout is important for safety reasons too, because when you beam in resources using the Tractor Beam, or send your hapless subordinates on expeditions without you, then hostile aliens can get onboard. The smaller ones are the real problem, crawling into service shafts running under each module to make nests, then nibbling away at nodes powering the rooms. If they get to the nodes under your reactors or greenhouses, you’re screwed, so it’s important that you can get to vital parts of your ship quickly when you have to. In theory this should create harrowing sci-fi horror scenes as vital systems shut down and rooms de-pressurise to the sound of blaring alarms. In reality though, disaster is easy to avoid. Just set up several turrets around your tractor beam and in contiguous service tunnels and you’re pretty much set for life. In order to get the kind of swarming Starship Troopers-like intensity you see in the trailer, you have to let it happen. Larger aliens, meanwhile, aren’t that much of a threat if you beam them in, because they can’t get into the vital organs of your ship. Yes, they can knock off a few crew members, who seem utterly incapable of defending themselves, but given that the only progression system for your crew is to create new and improved ones, it’s no big loss. There’s an imbalance in the challenge here. If things go wrong on your ship the disaster can escalate very quickly, but it’s too easy to block off the avenues by which that can happen. My first run of Genesis Alpha One lasted about five minutes, as some space-mites got into my ship’s underbelly, nibbled the nodes, and duly blew everything up. On my second run, a rudimentary, never-upgraded defensive setup ensured that I completed a good 10-hour run while rarely breaking sweat. With no depleting resources like fuel or food, you could almost forget this is a roguelike, because you’re rarely forced into those high-stakes situations and dilemmas. It doesn't even matter when you die. The game auto-assigns you another near-identical crew member when it happens. You're most likely to die during harvesting missions, where you land on procedurally generated planets to gather resources with up to two crew-mates. With the planets’ 70s sci-fi neon tones and synthy soundtrack, you could almost squint and mistake it for No Man’s Sky. What it actually is is a simple wave-survival segment where you harvest resources from within a few feet of your ship while enemies beam in to attack you. You can set up turrets and energy barriers, or take on your assailants using a weapons arsenal that expands as you research new techs and acquire new samples from fallen foes. The shooting is as weightless as the flailing ragdolls of dead aliens, and the rhythm of these encounters is exactly the same each time, even if the aliens vary. Try to explore more than a couple of hundreds yards from your ship, and you hit a force-field. The saving grace of these missions is that they feed back into your ship-building and research—the strongest part of the game. It's exciting to discover blueprints for new modules, weapons and suit upgrades in shipwrecks. When you find new aliens, you can splice their DNA with human DNA back on your ship. There’s a mad-scientist joy to creating rock-monster-human hybrids in the clone lab, or seeing what comes out if you mix in some spider-alien DNA. The statistical and visual differences between hybrids are limited however; each hybrid is essentially a mask wrapped around a human clone’s silly featureless face. But at least it gives you little goals to aim for on a journey that often lacks urgency. If the atmosphere of a planet deemed worthy of settling is filled with, say, nitrous oxide, you may even consider methodically executing your existing human crew and replacing them with N2O-breathing hybrids. That's a cruel way to treat your crew, but they have so little character it's hard to care. The human clones look disconcertingly like Working Joes from Alien: Isolation, except instead of uttering darkly comical meme material while throttling you, they’re just walking tutorial menus that describe the room you’re standing in. You can build a canteen for crew who aren’t assigned to tasks, but even there they bimble around listlessly with no needs or interactivity. At one point, I shot a crew member, partly out of boredom, but also in the hope of getting human DNA samples for my cloning research. But I got nothing, and felt nothing. It’s a stark contrast to similarly reticent people-management games like FTL and the bizarre, brilliant Kenshi, where the games’ clever systems help spark my imagination, encouraging me to mourn lost lives or otherwise weave characters’ deaths into a story. The disparate parts of Genesis Alpha One actually fit together quite well, but none of them are high-quality parts. You can lose yourself for a while in designing your ship, giving its corridors a nice colour scheme, and tinkering with new DNA and alien abilities, but when you’re done you still have to go back to those bland tasks alongside your bland colleagues. Where’s my Working Joe to tell me everything’s going to be OK as he smashes my brains out against the wall?